India’s biggest festival of giving, Joy of Giving week (now called Daan utsav) is back (October 2nd to 8th). 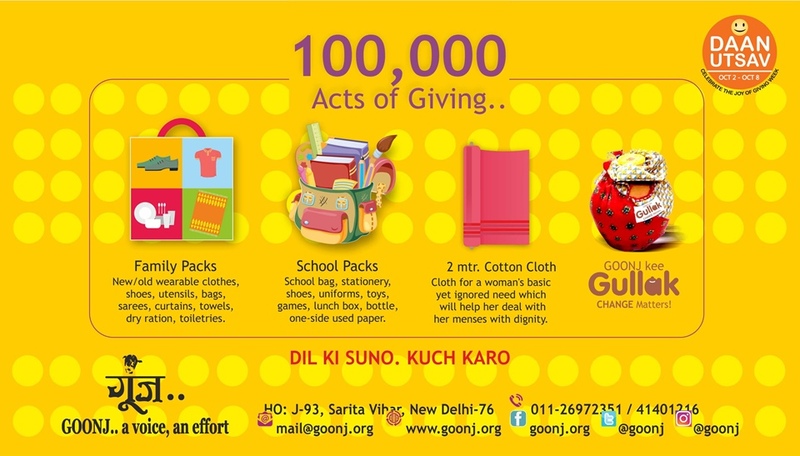 This year, Goonj has made a simple call of ‘Dil Ki Suno Kuch Karo’ to people through its unique campaign – ‘100,000 Acts of Giving’..
Here’s a poster for your reference. Do initiate the campaign in your schools, colleges, residential societies, clubs and offices. We will be there in many additional cities and we want people to run the campaign in many more. For details, please refer-http://goonj.org/page_id=7351/ or write to jgwgoonj@goonj.org . ‘Delhi Half Marathon- Nov 20th’ is another mega annual event that invites people to run for a cause.. This year, Goonj is looking forward to 1000 people to run for its annual winter campaign ‘Odha Do Zindagi’ and spread the message that ‘Cold doesn’t kill people, lack of clothing does‘.. Do join us as individual, group of people or a corporate team. Here are details to register-http://www.icfn.in/event/ADHM/goonj/choose-a-target/ we will soon be sending details on the messaging and other aspects. The registration closes on Sept 30th. Please connect with Jigisha onjigisha@goonj.org to run for Goonj. Please keep an eye on Facebook, Twitter, Website for regular updates.